Aleksei Drozdov won the Moscow Combined Events Championships with a World season best of 6129 points (7,02 - 7.58 - 16.17 - 2.09 - 8,24 - 4.80 - 2.48,70). The second result but not in the main final was achieved by Aleksandr Pogorelov — 6085 points (7,03 - 7.53 - 15.67 - 2.09 - 8,17 - 5.10 - 2.59,16). The Russians’ results are the first claims for the participation at the 11th IAAF World Indoor Championships on 10-12 March in Moscow. In accordance with the WIC standards, for the combined events, eight athletes will be invited by the IAAF: the top 4 athletes in the 2006 Indoor Lists (as at February 20th 2006) and the top 4 athletes in the 2005 Outdoor Lists. 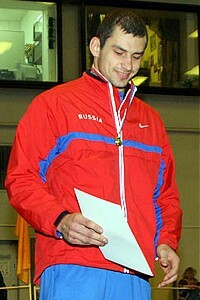 Aleksandr Pogorelov is fifth in the 2005 outdoor top list, so he must stay in the top 4 athletes list till 20th February or one of the 2005 top 4 athletes must refuse his participation. Going by the last year’s statistics, Aleksei Drozdov’s result is enough to stay in the top 4 athletes list in this season.